Building Baby’s Library: Some old. Some new. Some tried and true. My first grandchild was born on January 29, 2017, and she has been born into a family of readers! That she would receive many, many books from me was never an issue. BUT having an event like #pb10for10 to focus my thinking about what to get her when is terrific. For #nf10for10 last February, I choose 10 non-fiction board books as a foundation for my grand-baby’s library. This time around I have added 10 fiction board books to that foundational shelf. So without further delay, let’s begin to build a library for baby! And when I say “old”, I simply mean that the book has been around for awhile in general and in my home specifically. My kids LOVED Carl and his antics. While I was getting ready to write this post, my husband re-read the book and laughed just as hard this time. Baby is sure to make this a favourite since she is from families who LOVE their dogs. No Matter What is a gorgeous book. It’s the story of Small, a mischievous fox cub, and his mother Large, who tries to explain the unconditional love a parent has for his or her child. This book is not one that will be out grown soon. With stunning illustrations and witty details, this story will be pulled out and re-read for years. While the lyrical rhyming text will grab hold of baby’s ear and her attention, the need for assurance that “no matter what I will always love you” is ongoing. Munsch may tell baby that mommy and daddy will love her forever, but Gloiri provides the assurances that it’s true. Obviously, these titles are new to our family. Published long after my own children had grown past picture books (some of us never do though! ), I have read these books to children in classrooms while working as a literacy coach. Olivia by Ian Falconer is a terrific match for my granddaughter. Olivia is big in spirit and life is grand! Falconer’s minimalist approach (dark lines on white background with accenting red) combined with his deadpan humour is sure to get mom and dad smiling as baby explores her world. Now, some will say that the next two books are a bit ahead for our little one, but like baby clothes, you never know exactly what books you’ll need when. AND I think we can often underestimate when children are ready to listen to longer stories with bigger ideas. So, I’m including 2 Jeffers’ books because they are fun and the brightly illustrated pages draw you in. Up and Down does a great job involving the parent and child with sharp visuals and a story that gets the child thinking about why things are the way they are. Why do penguins have wings, if they don’t fly? What’s your theory? In A Little Stuck, Floyd gets his kite stuck up a tree. He throws up his shoe to shift it, but that gets stuck too. So he throws up his other shoe and that gets stuck, along with… a ladder, a pot of paint, the kitchen sink, an orang-utan and a whale, amongst other things! Will Floyd ever get his kite back? A hilarious book with a wonderful surprise ending that Like Up and Down can generate conversations about predictions and solutions to the problem. Both books help parents and baby think about the world and ask questions to understand it better. In 1995 my mom passed away and the son whose daughter’s library I’m building never knew her. She was inimitable, but today her great-granddaughter carries her name and already I can see my mom’s love of life in her. My mom’s favourite song was “What a Wonderful World” and this lovely version of the song is a must. Look at the richness of the illustrations and of course, the lyrics will never grow old. I would be completely remiss not to include a sing-a-long book on this picture book shelf. Pete, of course, is just too much fun. James Dean brings us a groovy rendition of the classic favourite children’s song “Old MacDonald Had a Farm,” sung by cool cat Pete and perfect for sing-a-long time with baby. Our girl is growing up near farms and we have farming friends, so she’ll be able to make some strong connections to the book and the song. Oh, and daddy loves to sing, too! Balloons love the moon, and a tuba loves a tune, but these don’t compare to the love we have for you. Canadian poet Lorna Crozier uses evocative rhyme, complemented by Rachelle Anne Miller’s whimsical imagery, to provide babies and toddlers with common concepts that explain just how great love is. Reading poetry to our kids helps them hear what language can do; how it dances and stretches and shrinks. More than Balloons is a treat. My mom was a grade three teacher, and when Dennis Lee’s first anthology, Alligator Pie, was published she bought it and taught with it every year until she left teaching. I was a teenager then, and I can still recall her reciting the title poem at home. It gave her such great delight. I never forgot the poem and Alligator Pie was the first anthology I bought when I became a mother. This book is just the title piece, on its own. It’s a board book and it’s awesome. Like the illustrations in Olivia, Sandy Nichols uses dark lines and sparse colour allowing the vignettes to pop off the page at us. Finally, here is Are You My Mother? for my son because this was one of his most favourite books. Are You My Mother? follows a confused baby bird who’s been denied the experience of imprinting as he asks cows, planes, and steam shovels the Big Question. In the end, he is happily reunited with his maternal parent in a glorious moment of recognition. We want to find lots of ways to let our children know that we love them and that we will continue to love them “no matter what”. Choose Your Favorites: All you need to do is choose ten picture books you cannot live without for whatever reason. In the first days of this event, everyone shared their ten very favorite titles. This still works. You will notice, however, that many past participants choose some type of theme to determine their selections. We’ll leave this up to you. Narrow Your List to Ten: It isn’t easy, is it? We’ve seen some crafty ways to get around that number. Write Your August 10th Post: Write a post about the ten books you cannot live without. Share your post on August 10th and link it to the Picture Book 10 for 10 Community. No Blog? No Problem: If you don’t have a blog, this might be the perfect time to start one — or there are a million digital ways to join (see post below). Of course, now with the Google Community it is quite easy to just post your favorites directly into the community without a blog. We will also be tweeting from the #pb10for10 hashtag. Comment: On August 10th (and maybe for a week — there are a lot of posts) take some time to read posts from other participants. Please comment on at least three. Pull out your library cards, load up your Amazon accounts, or better yet – plan a trip to your local bookstore on August 11th because you’re going to be unable to resist checking out (or purchasing) a few new picture books. We hope to see you on the 10th! Love the Carl books. Definitely an oldie, but goodie. Thanks for the list. Alligator Pie is still one that student-teachers look for on a regular basis.Just shows the importance of a book when people are young and how they’ll remember those that they connected with enough to come look for when they’re adults. Love your list. 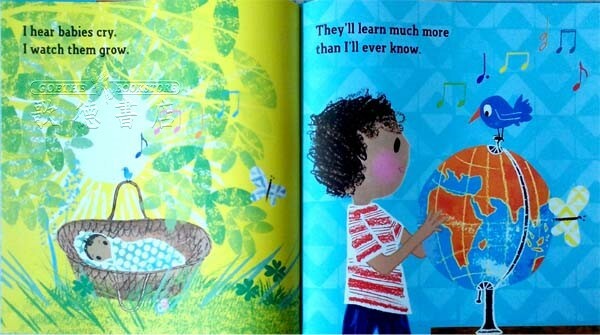 I’m became a grandmother last summer, so last year’s PB10for10 was focused on books to sing. Happy to see some titles I know (No Matter What was a favorite of my own kids) and some new ones to explore. Are you my mother?! Twenty years later I can still hear my daughter’s giggle about “You aren’t my mother, you’re a snort!” Thanks for the list. Love your list. I made one, too about my granddaughters, but they’re older. I work at a used bookstore and the board books are very popular. We love when they’re donated! I’ll note some of these for future gifts! Love that Alligator Pie is there, and What A Wonderful World is a favorite song. Thanks!